Today we are excited to announce My tasks — one dashboard where you can see all tasks assigned to you, across conversations. It is available for all Fleep for Business users. If you’re a free user of Fleep, you can start a Business trial to try out My tasks. We have built Fleep Tasks so you can create, assign and manage tasks right in your main work communication tool. Fleep Tasks are contextual — you can create them right in the conversation, where discussion takes place and decisions are made. If necessary, anyone can ask for further details or any other questions right in the conversation. Furthermore, everyone in the conversation can see the progress of tasks and get notified when tasks are marked as completed. Further, Fleep Tasks are conversation-centric. That means that all tasks are created and managed in conversations. Until today, that is. You can now use the My tasks view to get an overview of all tasks assigned to you. 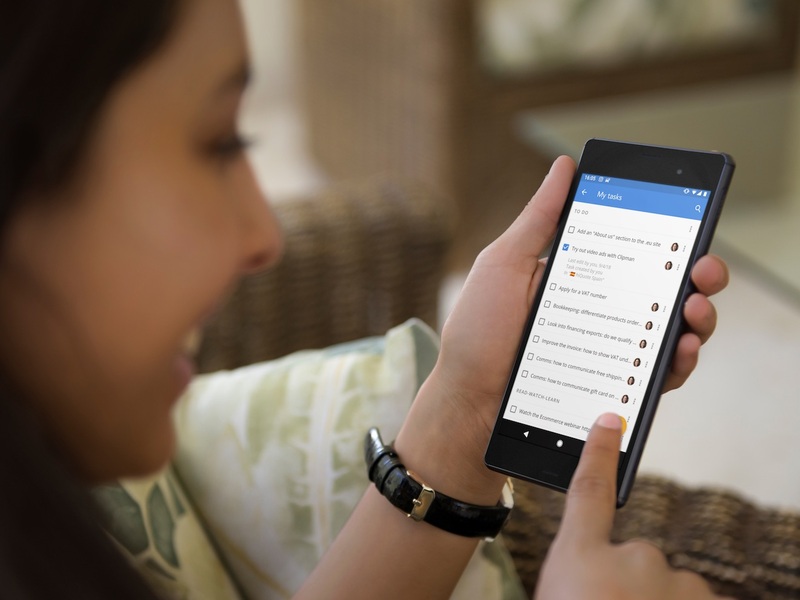 We have built My tasks so you have one place where you can see and manage all tasks assigned to you, across all of your conversations. 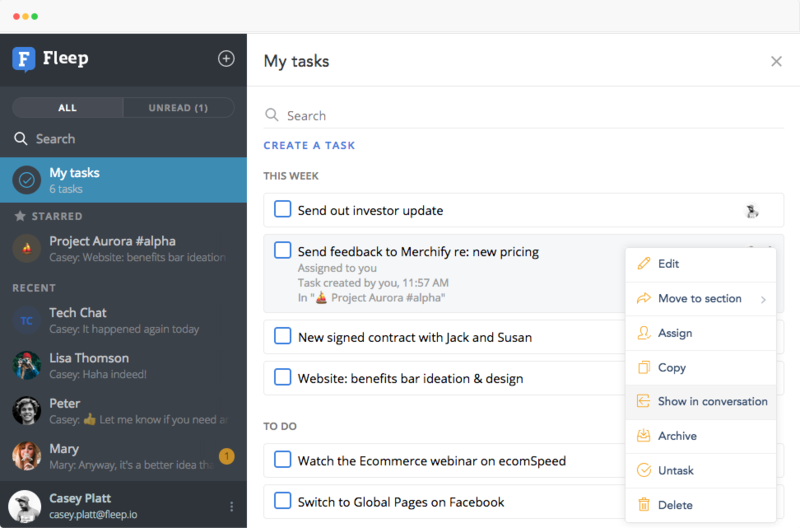 In the My tasks view, you can manage and organize the tasks as you see fit — reorder them, group them into different sections or archive the tasks that are no longer relevant to you. Even more, you can also create Private tasks that are visible only to you. So, let’s say your team has separate conversations for different ongoing projects. Previously, you’d have to click through the different conversations Taskboards to see the tasks assigned to you. Now, you can see an overview of all the tasks assigned to you on My tasks. You can check the task’s footer to see what conversation the task or located in (or if it is a Private task). Even more, you can use the “Show in conversation” action to jump to the task in the source conversation. If you’re a Fleep for Business user, then you already have the My tasks entrypoint at the top of your conversation list. Click on it to open the My tasks view. You will see a list of all the tasks assigned to you in your conversations — if there are none, then you can get started by creating a private task for yourself. If you’re a free user of Fleep, then all you need to do is start a Fleep for Business trial and My tasks will appear to you in Fleep. Use the entrypoint on the Pricing page or head directly to fleep.io/admin. Fleep for Business is €5 per account per month (when paid annually). Learn more in this Help Center article: What is Fleep for Business? If you move a task to a different section in the My tasks view, it will not be moved in the original conversation (and vice versa!). This also applies to archiving tasks — so, archiving a task in My tasks will not archive it in the original conversation. So, you can organize your tasks as you wish! Private tasks do not have an assignee avatar tied to them — so you can easily differentiate between private tasks and tasks that have been assigned to you in your conversations. If you cancel your Fleep for Business subscription or your trial ends and you’re downgraded to a free user, you will lose access to all Private tasks you’ve created. Whenever you upgrade to Fleep for Business again, you will regain access to your Private tasks. We hope you enjoy managing your tasks in the My tasks view. Do let us know what you think via support@fleep.io. Let’s also stay in touch through our social media channels. We’re on Twitter, Facebook, and LinkedIn.